so, got caught in an avalanche today. triggered it, not fully buried, but carried 100m or so over a small drop, rocks etc. used airbag, and got lucky. risk 3, with guide, route had been skied already. midday, but its not spring. helmet was a lifesaver. will post a few pics, but sadly no video. I'm pleased you are here to tell the tale. @hamilton, sounds awful and glad you are okay. 100m is a long way when pictured in the context of a football pitch. Thank you for sharing - where did this happen? @hamilton, glad you’re ok! Where were you skiing? Had the guide already skied the same route before you? Good to hear you survived the experience unharmed. Ski Safely all. hamilton, excellent post. Well done (and brave) for posting. Bergmeister, any stressful procedure practised becomes more routine and less stressful. Even in practised scenarios most people at first move too fast, fail to communicate, and stop thinking sensibly. With repeat this all improves. @hamilton, I feel for you, and agree with your points, but would add that local knowledge is also key. I was out last Saturday and my guide and I triggered 2 separate slab avalanches on consecutive runs, but neither of us (or anyone else) were caught, but it was close. The risk was 3, and we knew the slope well, and that this particular pitch is avalanche prone. The route we were on drops almost 1900m, and the conditions as expected changed from perfect powder at the top, to mixed wind blown in the middle, and then to a change of terrain and slope angle when getting down to the tree line. We knew we were the only skiers on the slope, and the first after the previous days snow fall (the first for 2 weeks). 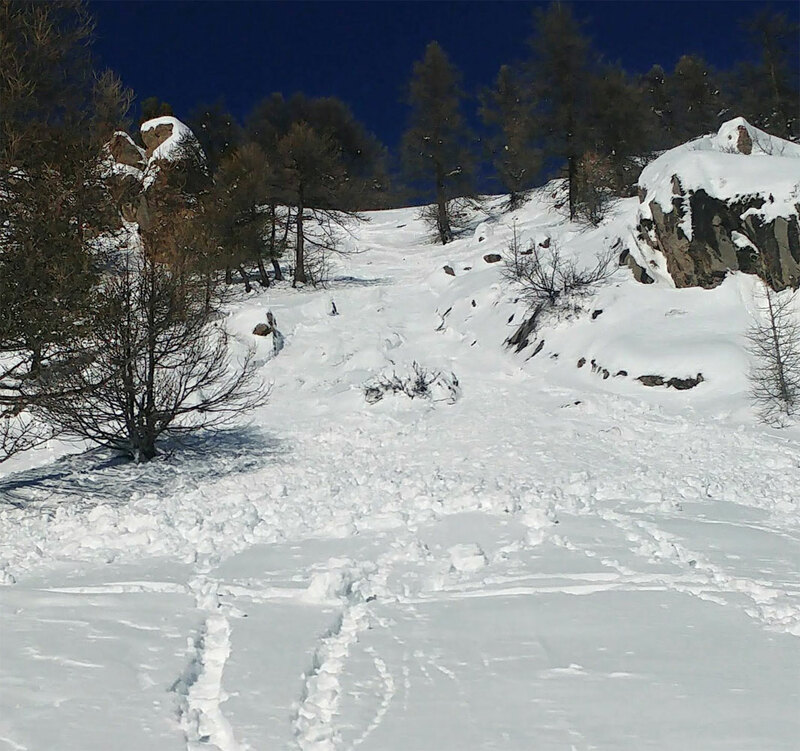 As is standard in avalanche terrain, we skied from safe point to safe point, with either 50m spacing, or wait to be called forward. My guide performed a ski cut, but the slope didn’t go, and once he was safe, I followed maybe a metre higher on the traverse. As I approached his position, the snow started to star crack below me, but held, then about 30m of snow behind me let go and about a 40cm deep slab broke free and slowly slid around 100m. The second one was on different line of the same route. A very inviting gully was checked, but deemed to be too high a risk. My guide turned below me away from the gully, but it that was enough to trigger the slab to go, he then traversed at speed being chased by the crack of the slide until he reached a safe point as about a 100m wide slab went. This only went about 30-40m, but the original gully went big time, as we could see powder clouds 400-500m down slope. I've posted this before but on PSB last year I did the off piste session with Steve Angus. He stopped on one pisted track and explained that we were going to do a practice to find him (although obviously he was in full sight all the time), then shouted go and skied off. It was remarkable how quickly it all broke down. There were 4 of us and one person quite clearly took the lead and 'handed out' different tasks (e.g phone emergency, get probe and shovel ready etc.) and started searching himself. That was about the only bit that went well. Firstly, the rest of us all left beacons on transmit while we carried out the tasks we'd been given. Then one person put the shovel blade down and it took off down the piste. Then someone didn't understand their beacon etc. etc. It was eye opening to realise how quick we panicked even in what was quite clearly a drill. As I'm starting to venture to off piste I think that some more time researching avalanches and doing searching practice is needed. Scary story from hamilton, especially as conditions don't sound like they were too sketchy,. @hamilton, scary stuff, but it sounds like you came out of it ok, even if your helmet didn't. With regards the poles thing, I tend not to use my straps on piste any more, but can you clarify what happened in your case? Am I the only one that finds this statement somewhat disconcerting? You were skiing in cat 3 (considerable) risk. You were skiing a run with a know avalanche risk and yet your guide decided to ski it and take you with him. It avalanched and you both went and did it again? Am I missing something? It avalanched and you both went and did it again? Am I missing something? No, I share your surprise/ concern.......why would you go in again? @OwenM, @Markymark29, The point you are missing is the local knowledge. The section that slabbed is well known to be a risk. It’s a roll over, change in slope angle from around 20 to 30 degrees, and accounts for a tiny percentage of the overall route/vertical. It is always approached with caution, checked carefully, and ski cut if there is potential for a slide. The first and second slides were hundreds of metres apart, so we weren’t blindly skiing down the same route that had already slid. The guide of course reported back to the office the location and severity of the slides, so that anyone else going out in the following days is aware. I’ve skied that route many times myself so know the area. However, if I was planning on going out in a new area, with an unknown guide and the risk was 3, I wouldn’t have gone out. @PowderAdict, it's known to be a risk so you did it? Is that not reckless for the sake of it? and ski cut if there is potential for a slide. The fact that the slope slid after the next skier, rather than straight after the ski cut, does suggest this is an imperfect solution. Nothing (other than not skiing) gives 100% confidence so I guess it's all about your appetite for risk. Just out of interest as we had a little incident day before yesterday, what was the aspect, altitude and angle of the slope, and nature of snow pack? Just that ours was ESE facing and was almost like a spring slide, very slow, thankfully as I was able to get out of the way. As for pole straps, I don't use them off piste / forest when skiing but I would not cut them off as some people do as when skinning / traversing with crampons on steep icy slopes I'll use them if at all possible as I don't want to slide and loose a pole which I've seen people do! I think people are just surprised that you seem very relaxed and somewhat flippant in your recounting that on a CAT 3 day, you twice skied an avalanche prone slope, twice caused avalanches which you weren’t quite in but using your own words, “it was close”. I am beginning to think there are two lots of skiers in the world, first set feel comfortable around an avalanche. Second set (I am a member ) getting avalanched is NOT an option..... you just don't know how big it may go! @peanuthead, I don't think people are questioning them for skiing on a risk 3 day, they're questioning the fact that they did it once, it slipped, and then they did it again. I am obviously missing something but where did the OP say that is what they did? @hamilton, have you had any sort of debrief from the guide or company , glad you got out safe , would be interested in the thoughts of the guide on what went wrong and what led to the choices made to ski this slope , and any other factors you can offer for the terrain and weather conditions around this event . Clearly, a lot of people don't view it the same way! I was replying to PowderAddict, not hamilton, the OP. Regarding the OP, I agree with your post. Regarding PowderAddict, I think my post stands true. I've skied plenty of powder runs on CAT 3 days but haven't been avalanched twice in two runs. Never ski offpiste in avvy-prone areas after 1100am. I think Stanton pointed out a few weeks back that this is bogus. Apparently they're aren't more slides in the afternoon for instance!? agree that its a free world and you makes your own choices when it comes to an individual managing risk , and I should have said "personally for me the best way is to avoid "....... but when it comes to a guide I expect a considered safe travel plan for the day and not to seek out known avalanche routes , and I hope id be in the majority when turning down a plan that does that . Outstanding technical analysis and advice. This should really go into the mountain guide's handbook.